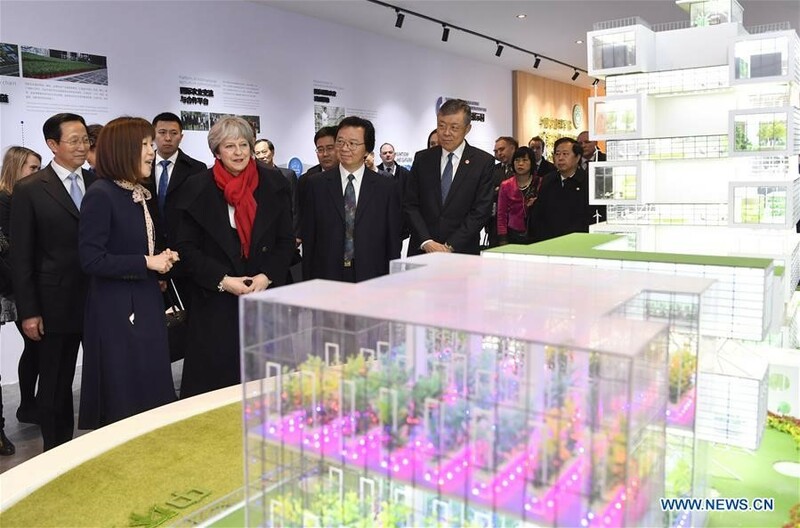 February 1, British Prime Minister Theresa May visited National Agricultural Science and Technology Demonstration Park, the Chinese Academy of Agricultural Sciences (CAAS). Mr. Han Changfu, Minister of Agriculture (MOA), Mr. Liu Xiaoming, Ambassador of China to the United Kingdom, Mr. Tang Huajun, member of the Leading Party Group of MOA and President of CAAS, and Mr. Chen Mengshan, Secretary of the Leading Party Group of CAAS accompanied her visit tour at CAAS. May expressed her appreciation for the achievements made by Chinese scientists in the field of high-tech agriculture. She said, both Britain and China are committed to improve crop yields and sustainable agricultural development, and are striving to reduce the impact on the environment in the process of agricultural production. The UK-China Joint Strategy for Science, Technology and Innovation Cooperation was officially launched during the UK-China High Level People to People Dialogue which was held in London in December, 2017. This strategy sets the framework for future cooperation, including an annual Flagship Challenge Programme which will focus on agricultural technologies in 2018. May looked forward to a more practical cooperation in the field of agricultural science and technology between Britain and China under the framework of the Joint Strategy. Han Changfu said that agricultural cooperation is an important part of Sino-British cooperation, and scientific and technological cooperation is a prominent highlight of agricultural cooperation. The Ministry of Agriculture is willing to work together with British counterparts to promote bilateral agricultural cooperation in accordance with the consensus reached by the leaders of the two countries, in particular by strengthening cooperation in agricultural science and technology innovation, using advanced agricultural technologies to improve farmers’livelihood and create a more beautiful country. Tang Huajun in his introduction said that the Chinese Academy of Agricultural Sciences has a long history of collaboration with the United Kingdom and has achieved good results in the fields such as food security, food safety, agroecology and sustainable development,agricultural adaptation to climate change, land and water resources management and capacity building.